American multi-instrumentalist, composer, singer, humanitarian and social activist, born May 13, 1950, Saginaw, Michigan, USA. He has been blind since shortly after birth. Inducted into Songwriters Hall of Fame 1983. Inducted into Rock And Roll Hall of Fame in 1989 (Performer). What happens if a release has two different record labels. In the singles chart is it treated separate as a new entry. anyone ever seen a stevie ep in yellow vinyl. It seems its the extra ep from songs in the key of life (nederlands press) however cant get any further info on it. From 72-79 imo there wasn't anyone in any genre who was close to the greatness that Stevie was producing. 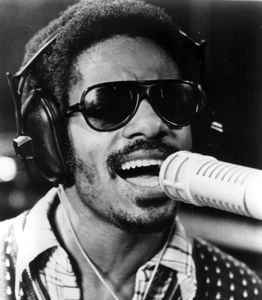 Stevie Wonder is possibly the only person in the 20th and 21st century world, that I would consider a musical genius. He has never seen anything in his life, and he can perform so many instruments perfectly and sing 99.9% better than every other musician on the planet. I saw him live in Manchester a few months ago, and was the greatest gig I have ever been to in my life, and what a nice person he is too. The above comments pay tribute to Stevie perfectly; what more can be said? The guy plays nearly every instrument imaginable with affinity and performs and records with such an uncanny ardor -- such a love and passion for music. While some songs like "I was Made to Love Her" and "Superstitious" are irresistibly soulful tunes, Wonder had a knack for contrasting this pace with melancholic masterpieces like "Blame It on the Sun" or "A Place in the Sun." Even his 80s era was highly regarded and respected. I shouldn't even begin compiling a list of favorites; there are just too many. Hands down, one of the greatest recording artists of all time. He's got my respect forever. What can one say about Stevie that already hasn't been recited? The words/phrases 'genius', 'God given talent', 'from a different planet', 'Soul music legend' etc all seem appropriate. The guy has been singing for so long right back to the early days of Motown as a child prodigy, up to the present. Although many younger people remember or associate Stevie with his music from the 80s, which was all very accessible and commerical music, his real creative peak and genius came to the fore during the 70s. His three albums in particular 'Innervisions', 'Fulfillingness First Finale' and 'Songs in the Key of Life' are landmark albums in Black music, Soul Music and any genre for that matter of popular music. The guy can play (& does on most of these albums) any instrument, he writes, he produces, he sings... He's just an awesome talent and either (or all) of these 3 albums would be in most self-respecting critics top 100 albums of all time. Music that is timeless, inspiring and legendary. RESPECT and then some!